On May 24, the United Nations' Committee on Non-Governmental Organizations considered requests by ninety-four different non-profit groups from across the globe to attain "special consultative status with the Economic and Social Council." As is usual, a number of UN member-states sought to delay or prevent approval by the Committee: The U.S. questioned the activities of an Iranian charity tied to the regime and a Sudanese charity linked to Al Qaeda, Cuba challenged an Israeli charity, and Mauritania – where slavery is still widespread – demanded more information on the activities of several anti-slavery organizations. Forty-six other non-profits, however, were not subject to objections or requests for further information, and received approval from the Committee. One of these, a charity named Saviour USA, is nonetheless a controversial choice. Based in Texas, Saviour USA is a registered 501c3 that describes its work as "instrumental in raising funds to support the families of martyrs in Pakistan." Saviour USA is the U.S. branch of the Shaheed Foundation, a Pakistani Shi'ite charity that operates under the aegis of the Iranian regime. 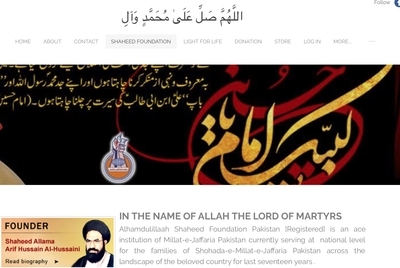 Both Saviour USA and the Shaheed Foundation represent the charitable arm of Millat-e-Jaffaria, a violent Pakistani Shi'ite organization that works closely with Tehran. This is not a secret. In fact, Saviour USA's website notes: "Shaheed Foundation Pakistan is an ace institution of Millat-e-Jaffaria Pakistan ... In its current form this institution began functioning in 1997 based on the teachings of ... Imam Khomeini." Saviour USA's website adds that the "pure blood of martyrs" is effecting change and working to "isolate the enemies of Islam and Pakistan." For Saviour USA, suffering for the Shi'ite cause is not a tragedy, but an aspiration: "Martyrdom is our adornment and a blessing for us and we must not shy away from it because it has been the reason of our existence through these fourteen centuries of turmoil." Millat-e-Jaffaria is better known as Tehrik-e-Jaffaria (TJP). Active since 1979, the same year as Iran's Islamist revolution, the TJP was established by Arif Hussain al-Hussaini, a devoted student of Iran's Ayatollah Khomeini. Today, the current TJP leader describes himself as the "personal representative" of Iran's current supreme leader. In 2002, Pakistani President Pervez Musharraf banned the TJP, along with a number of Sunni groups. Musharraf accused members of the TJP and its sister organization, Sipah-e-Sahaba, of involvement in the murders of hundreds of Pakistanis in the previous year. Should the U.S. government really allow an American charity that openly funds the TJP to keep its 501c3 status?